Laws regarding this issue vary by region. You have likely heard the saying "every dog gets one bite." This means that if your pet has never shown any aggression, you are less likely to be held liable if the dog bites someone for the first time. If your pet has shown aggressive tendencies, you could be at risk for a very large liability loss. This is because you knew of the danger and didn't take adequate steps to prevent the bite. Insurance companies are very reluctant to continue to insure a pet that has bitten someone. Dog Bites are typically covered by your policy, but the company is not likely to continue to provide coverage as long as you own the pet. It is very important that you keep your pet under close supervision, especially around children. According to the Insurance Journal, over one-third of all homeowners liability claims involved dog bites. Dog bite frequency went down slightly between 2003 and 2012, but the average cost increased by over 50%. Insurance companies pay out close to $500 Million a year on dog bite claims and the average insurance claim is now nearly $30,000. 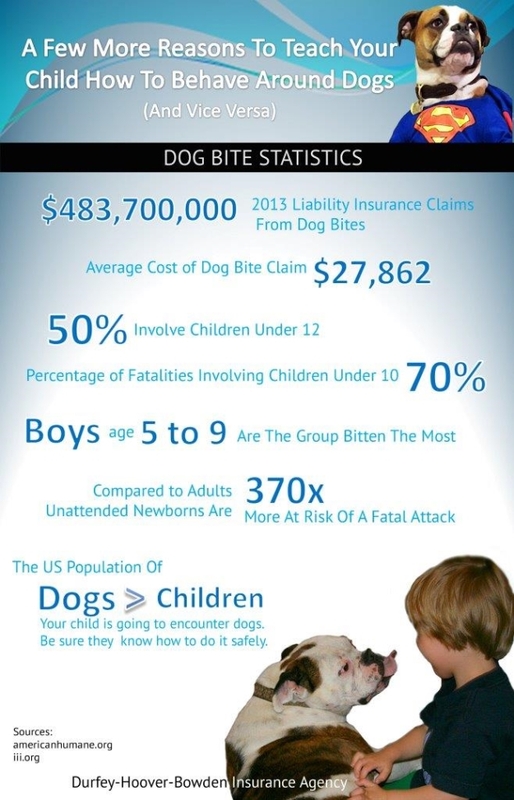 The American Humane Association reports that 50% of dog bites involve children under 12. It is very important to teach your children how to deal with unfamiliar dogs. Even children with experience with dogs at home can make the mistake that they can treat all dogs like their dog. No one wants to choose between their pet and good insurance coverage for their family. Different dog breeds have very different needs. Work with your local shelter to be sure that you are getting one that fits your lifestyle and experience.